Downstairs there is a fully equipped kitchen, a separate bedroom and a bathroom. There is also a big terrace with panoramic sea view. This charming property also has an open galleried loft consisting of a twin bedroom with en-suite bathroom. Please be sure to check our website with virtual tour. Notes on accommodation: All accommodation has private terrace of its own. Both of the apartments are more like houses than apartments, with vaulted ceilings & antique furniture. Tastefully & simply decorated in pastel colours. Views to die for from terraces. Wifi in all apartments Outside: The whole property is in approx 1 acre of well tended established gardens. With large BBQ & al fresco dining area. Steps up to brand new swimming pool with ample room for sunbathing & relaxing for all. Lots of quiet areas within the grounds of the property for reading & having your own space. The website photos are good but they don't do this lovely property justice! Sparkling clean, comfortable, bright and spacious with a huge terrace and breathtaking views across Gaios and to the mainland in the distance. Set in beautiful gardens there are quite a few steps, lots of flowers and archways laden with bougainvillea, and a really nice pool at the top with more amazing views. Well-equipped kitchen, quiet, efficient air-conditioning in the bedrooms (the second 'bedroom' is on a mezzanine and has screens for privacy), a fan in the ceiling above the terrace. Everything you could want for a really comfortable, relaxing stay. Kostas, our host, was very helpful and friendly, taking us to and from the port for the hydrofoil/ferry and arranging alternative boat crossing due to the ferry strike. The apartment is a short (quite steep) walk into the centre of the town, so car hire isn't necessary although I would recommend it so you can explore the whole island and its gorgeous, hidden beaches. Perfect stay in a perfect apartment. Would love to return! Thank you for your great comments.It was a pleasure for us to have you as clients.We hope to see you again in the future. We recently returned from a wonderful week staying with Kostas and Efi at Bougainvillea 1. Kostas kindly met us at the port and drove us on literally a 5 minute journey to our accommodation. We originally booked the studio but Kostas said he had a surprise for us and had upgraded us to the apartment. The view from the apartment is simply superb and overlooks Gaios and the beautiful harbour. The gardens surrounding the apartment are lovely and there is a pool with stunning views over the surrounding area. The little complex, 2 apartments and a studio, is on a hillside so there are steps to negotiate but that is a small price to pay for the views over Gaios. 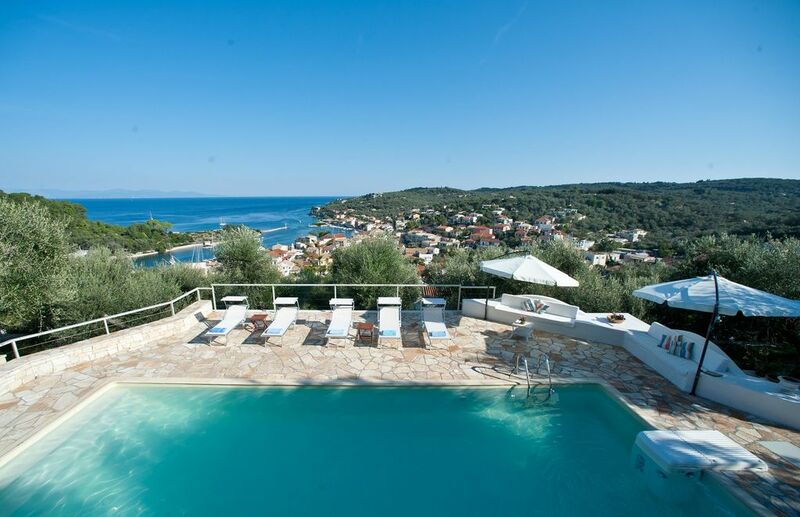 Paxos is a beautiful Island and if you are looking for a base to explore it then I cannot recommend Bougainvillea Apartments and Studio highly enough. A credit to Kostas and Efi. Nearest airport Corfu. Daily direct flights www.skyscanner.net for best deals. 2mins drive/10mins walk from port. Please be sure to check our website with virtual tour. Click on the link at the bottom of page near the contact details. Booking Notes: Deposit required to secure booking. Balance payable in full at 4wks prior to arrival. Changeover Day: Preferred arrival day Monday but contact us if this is a problem. Minimum 7 day stay Notes on prices: Prices shown for Units 1 & 2 are for 4 persons. Possible discounts for 2 people (except for peak period mid July to mid August) Email for details All of the units can sleep an extra person on sofa bed. A small supplement charge may be payable, please contact us to discuss.